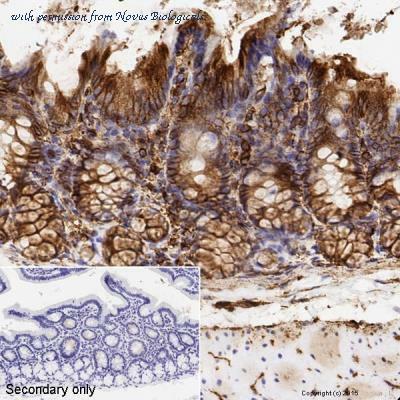 Immunohistochemistry: alpha Tubulin Antibody (DM1A) [NB100-690] - Analysis of formalin fixed colon sections. Heat mediated antigen retrieval was performed using sodium citrate buffer for 20 min before incubating with primary antibody at a 0.5ug/ml dilution for 15 min at RT. Immunocytochemistry/Immunofluorescence: Tubulin Antibody (YL1/2) [NB600-506] - IF Confocal analysis of NIH/3T3 cells using Tubulin antibody (NB600-506, 1:5). 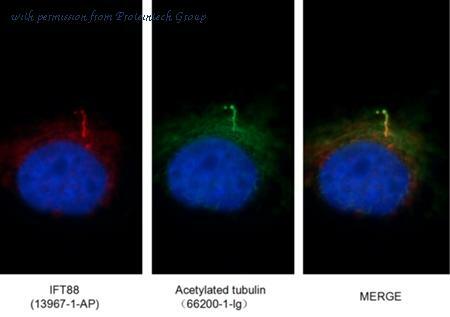 An Alexa Fluor 488-conjugated Goat to rat IgG was used as secondary antibody (green). Actin filaments were labeled with Alexa Fluor 568 phalloidin (red). 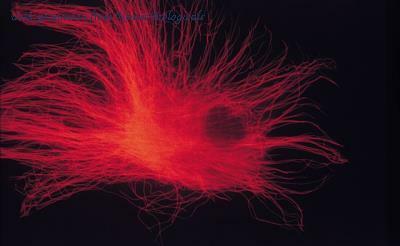 DAPI was used to stain the cell nuclei (blue). 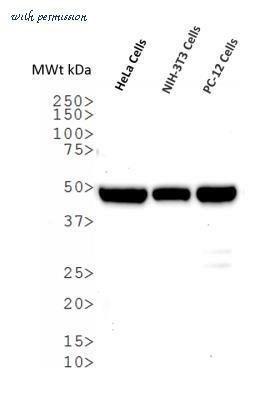 Western Blot: Tubulin Antibody (YL1/2) [NB600-506] - WB analysis of whole cell lysates of HeLa, NIH-3T3 and PC-12 cell lines using Tubulin antibody (clone YL1/2). 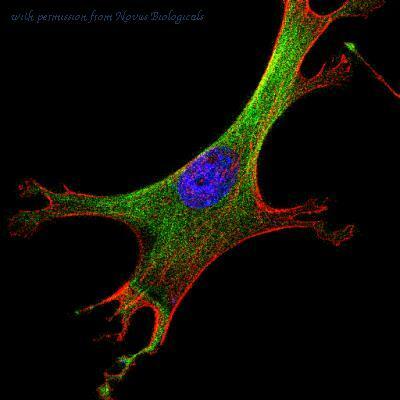 Immunocytochemistry/Immunofluorescence: Tubulin Antibody (YOL1/34) [NB100-1639] - HeLa cells. 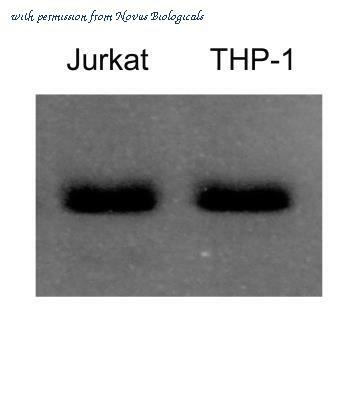 Western Blot: Tubulin Antibody (YOL1/34) [NB100-1639] - Western for tubulin in Jurkat and THP1 cells. Image from verified customer review. Western Blot: Tubulin Antibody (YOL1/34) [NB100-1639] - WB analysis of Tubulin and CD107b proteins on lysate of J774 cells (mouse BALB/c monocyte macrophages cell line) using different dilutions of rat anti tubulin alpha (NB100-1639) and rat anti mouse CD107b (NB100-65275) antibodies respectively with final signal detection employing goat anti rat IgG: Dylight 800. 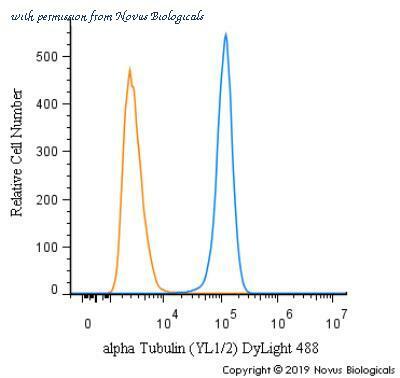 The acetylated Tubulin(Lys40) antibody from Proteintech is a mouse monoclonal antibody to a peptide of human acetylated Tubulin(Lys40). This antibody recognizes human, mouse, rat, dog,pig antigen. 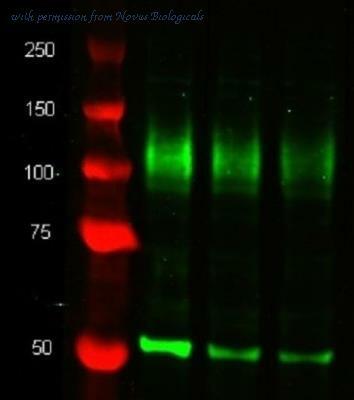 The acetylated Tubulin(Lys40) antibody has been validated for the following applications: ELISA, IF, IHC, WB analysis. 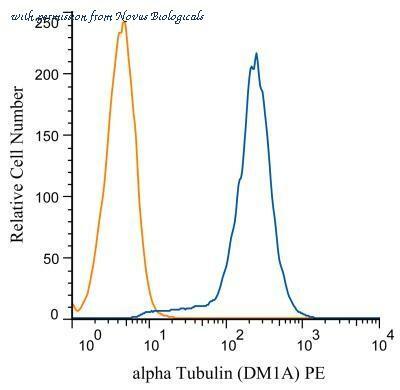 The alpha Tubulin antibody from Proteintech is a rabbit polyclonal antibody to a recombinant protein of human alpha Tubulin. This antibody recognizes human,mouse,rat antigen. 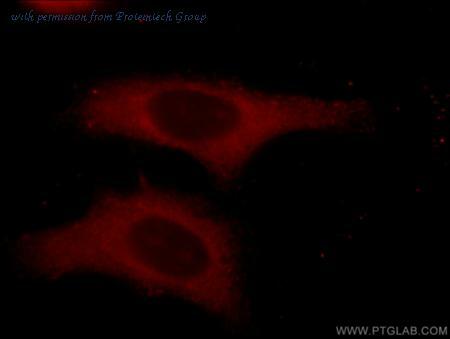 The alpha Tubulin antibody has been validated for the following applications: ELISA, IHC, IF, WB analysis. 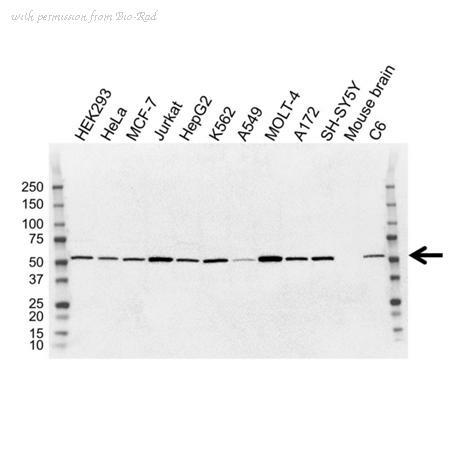 Detection of Human, Mouse, and Rat alpha Tubulin by Western Blot. Western blot shows lysates of HeLa human cervical epithelial carcinoma cell line, Jurkat human acute T cell leukemia cell line, NIH-3T3 mouse embryonic fibroblast cell line, Neuro-2A mouse neuroblastoma cell line, and Rat-2 rat embryonic fibroblast cell line. 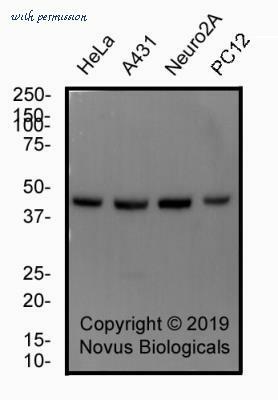 PVDF membrane was probed with 0.05 ╡g/mL of Mouse Anti-Human/Mouse/Rat alpha Tubulin Monoclonal Antibody (Catalog # MAB9344) followed by HRP-conjugated Anti-Mouse IgG Secondary Antibody (Catalog # HAF018 ). 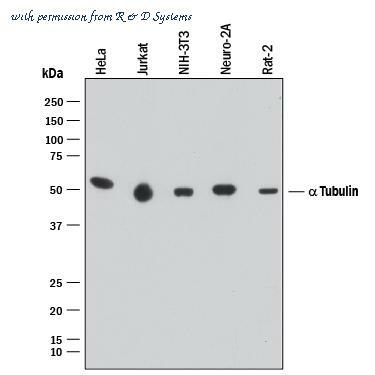 A specific band was detected for alpha Tubulin at approximately 52 kDa (as indicated). This experiment was conducted under reducing conditions and using Immunoblot Buffer Group 1 .